Flexible electric cable (flex), sold by the metre. Black / red DC power cable 10A / 0.79mm. For low voltage use only . Sold by the metre, order a quantity and receive one length of cable (eg order 5 and receive one 5m long piece of cable). 3182Y black 2 core 0.75mm flexible cable. 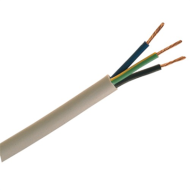 Copper cable with PVC insulation. Sold by the metre, buy as much as you like up to 100 metres and get it all in one big length. 2192Y oval black 0.75mm 2 core flex. Sold by the metre. If you buy more than 1 metre, you will get all your cable in one big length. eg, buy a quantity of 5 and you will get a 5 metre length of cable (up to a max of 100m). Orange 0.75mm 2 core 3182Y flex. Suitable for loads up to 6 Amps. Sold by the metre, buy as much as you like (up to 100m) and receive it in one big piece. 2182Y 0.75mm 2 core flex. Also known as H03VV-F2 Suitable for loads up to 6 Amps. Sold by the metre, buy as much as you like (up to 100m) and receive it in one big piece. 2192Y oval white 0.75mm 2 core flexible cable 2192Y. Sold by the metre. If you buy more than 1 metre, you will get all your cable in one big length. eg, buy a quantity of 5 and you will get a 5 metre length of cable (up to a max of 100m). 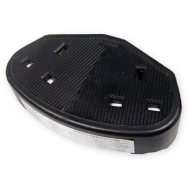 Heavy duty rubber 2g 13A trailing socket, use to make a heavy duty extension lead. Black / red DC power cable 20A / 2.12mm. For low voltage use only . 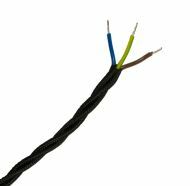 Sold by the metre, order a quantity and receive one length of cable (eg order 5 and receive one 5m long piece of cable). 2183Y 0.5mm 3 core flexible cable. Sold by the metre. If you buy more than 1 metre, you will get all your cable in one big length. eg, buy a quantity of 5 and you will get a 5 metre length of cable (up to a max of 100m). 3183Y black 3 core 0.75mm flex, sold by the metre. 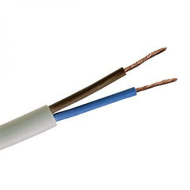 Copper cable with PVC insulation. Buy up to 100 metres and receive your cable in one big length - eg buy 5 and receive a 5 metre length of cable. Gold 3 core 0.75mm flex. Gold coloured, not real gold . Sold by the metre, buy as much as you like up to 50 metres and get your cable in one big length. Eg. 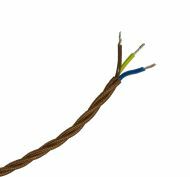 buy a quantity of 5 and receive one continuous piece of cable 5 metres long. Black 3 core 1.5mm flex. 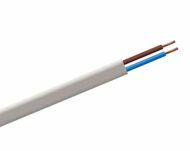 Also known as H05VV-F3 Copper cable with PVC insulation. 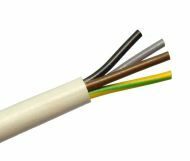 Sold by the metre, buy up to 100 metres and receive your cable in one big length - eg buy 5 and receive a 5 metre length of cable. Blue 1.5mm 3 core arctic flexible cable. 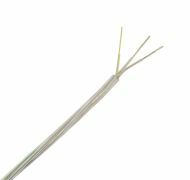 Special cable suitable for very low temperatures. Makes a great extension lead cable. Sold by the metre, buy as much as you like up to 100 metres and get your cable in one big length. 3183Y 3 core 1.5mm flex. Also known as H05VV-F3 Suitable for loads up to 15 Amps. Sold by the metre. buy the quantity you need and you will get all your cable in one big length. eg, buy a quantity of 5 and you will get a 5 metre length of cable (up to a max of 100m). Blue 2.5mm 3 core arctic flexible cable. 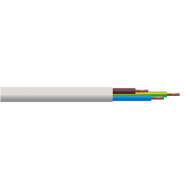 Special cable suitable for low temperature use. Sold per metre, buy as much as you like (up to 100m) and get it all in one big length. 3184Y 4 core 0.75mm flex cable. Also known as H05VV-F4 Sold by the metre. If you buy more than 1 metre, you will get all your cable in one big length. eg, buy a quantity of 5 and you will get a 5 metre length of cable (up to a max of 100m). 0 to 60 °C rating. 3185Y 0.75mm 5 core flex. Also known as H05VV-F5 Sold by the metre, buy as much as you like (up to 100m) and receive it in one big piece. 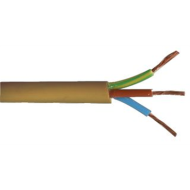 6 core alarm cable, sold by the metre. Buy as much as you like (up to 100m) and get it all in one big length. Eg, buy a quantity of 5 and receive one piece of cable 5 metres long. Replacement braided non kink flexible cable / cord for electric steam iron. Sold by the metre (max 47m). 3 x 1mm2 cores, max 10 amps, suitable for irons up to 2.4 kW / 2400 Watts @ 240V. 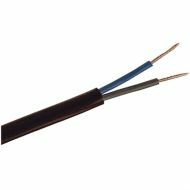 13 strand 0.16mm² flexible speaker cable / wire, with coloured tracer to identify polarity. Sold by the metre. 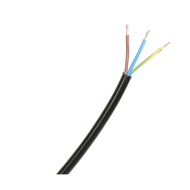 Buy as much as you want and it will be delivered in one piece (up to a max of 100m), for example buy a quantity of 5 and receive one piece of speaker cable 5 metres long. 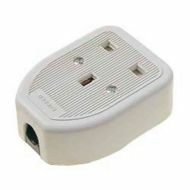 Single 13A trailing socket, use to make an extension lead. Trailing socket with 2 x 13A sockets. Use to make an extension lead. 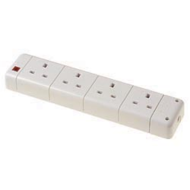 Trailing socket with 4 x 13A outlets. Use to make an extension lead, total load must not exceed 13A. Heavy duty rubber 13A trailing socket, use to make a heavy duty extension lead.